My Maid Invests in the Stock Market… And Why You Should Too! Once upon a time, Bo Sanchez was a poor missionary who received an allowance of P30 a day. There were days when he couldn’t afford to pay for a bus ticket to preach in a prayer meeting. But in 1998, he transformed his life. Today, he owns many small businesses, all running on autopilot, because he spends 90 percent of his time still doing missionary work. He also learned how to invest in the stock market. And he has never forgotten the true purpose of wealth — to love others. In this inspiring yet highly practical book, you’ll read the fascinating story of how he helped three of his house helpers invest in the stock market and build their retirement fund. He’ll tell you how he taught them the 5-envelope system. He’ll explain how he painted a clear vision of their future in their minds. 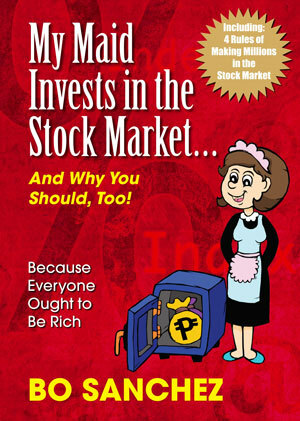 In this book, you’ll learn his “4 Rules to Making Millions Thru the Stock Market”. Bo believes that you can retire a multimillionaire by investing in the stock market. Because if his helpers can do it, you can, too. This entry was posted in Book Review, Free eBook, Stock Market and tagged Bo Sanchez, SAM, truly rich on March 27, 2013 by Bobet Prudente.